With hedges to trim, a meadow to cut and a continuous stream of heavy stuff to move (not least wind turbine components) a tractor would be a great assess. 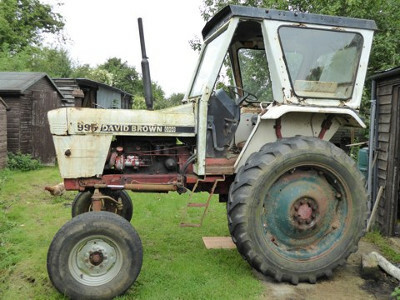 My friend, Dave, who farms a small four-acre small holding, has a David Brown 885 which I could always borrow. However, Dave's tractor isn't quite so easy to get from place to place - although road registered and insured, the top speed of 20mph is a bit of a problem along a high speed, A-class roads and he is about 10 miles away so not something to do regularly. Trailering it over is possible but again a bit inconvenient. We had discussed the possibility of us sharing implements like a hedge cutter, so it made sense if I was to buy an old tractor that it should be similar. I had looked on a well known auction site for some time wondering if I could justify such a luxury, restored models were selling for £3-4000, but I don't want a 'restored' model, I want to use it. Then I noticed a scruffy 995 'high clear' model with decidedly dodgy tin work. I made a low bid without expecting to win the auction. The next thing I was the highest bidder and had to explain this 'unexpected purchase' to my wife! Then I had to get it home from Lincolnshire. Do I really need another project at the moment?